Situato a Golden Sands, a soli 1,6 km dal centro di Golden Sands e a 1,6 km da Party Street, l'Apartment in Bendita Mare aparthotel offre un giardino. L'appartamento, situato in un edificio risalente al 2008, dispone di connessione Wi-Fi gratuita. L'appartamento presenta 1 camera da letto, 1 bagno con asciugacapelli, una TV a schermo piatto e una cucina con forno, microonde e frigorifero. A vostra disposizione una cucina con forno. A vostra disposizione anche una piscina all'aperto. L'Apartment in Bendita Mare aparthotel vanta anche una terrazza. La struttura dista 2,4 km dall'Aquapolis Golden Sands e 5 km dal Monastero di Aladzha. L'Aeroporto più vicino è l'Aeroporto di Varna, a 26 km da appartamento Bendita Mare. Questa zona di Golden Sands è una delle preferite dai nostri ospiti, in base alle recensioni indipendenti. 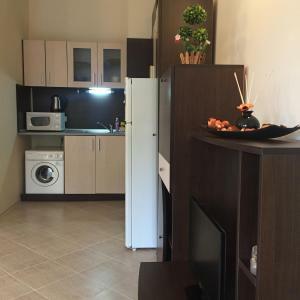 Quando vuoi soggiornare presso Apartment in Bendita Mare ApartHotel? 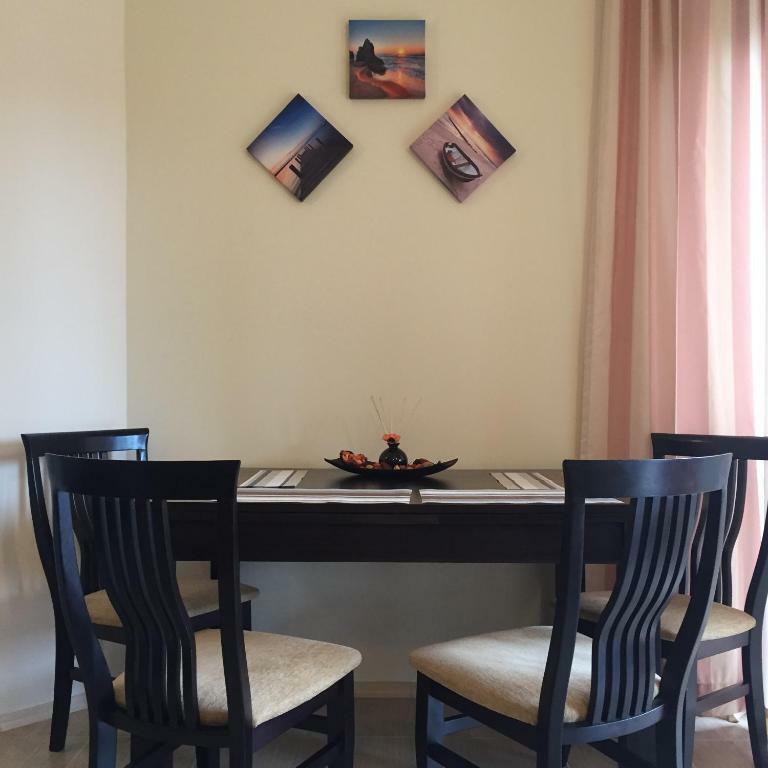 The Apartment is part of a great complex Bendita Mare located in Golden Sands, Varna, Bulgaria. Only 2 min. walk from the beach and 5 min from the centre. 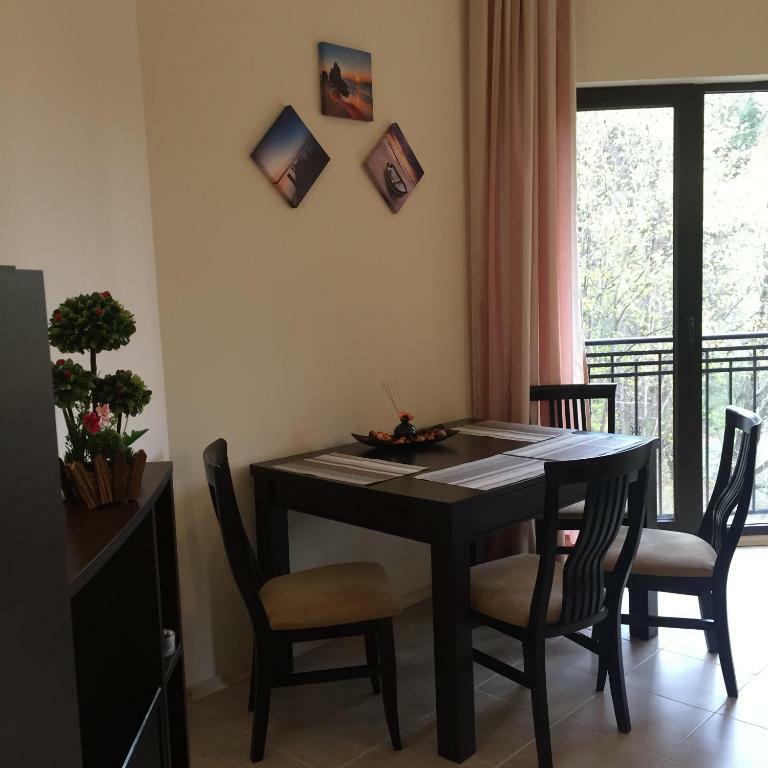 At your dispolsal you have a cosy bedroom, big living room with kitchen, bathroom and wonderfull terrace. You also can use freely parking and two swimming pools, including sunbeds and umbrellas. The complex have as well a pool bar, a-la-card restaurant, SPA and Wellnes Centre and Fitness Centre.You can cook your own food in the kitchen.It is equipped with everithing you may need- cups / for coffee, water and wine /, plates, bowls, pans, banners, trays, spoons, forks, knives and basic spices. On the terrace there is a table and chairs, so you can drink your coffee or wine and enjoy the park view. In the complex there are two big swimming pools and one for children. Enjoy for free- incl. sunbeds and umbrellas. The beach is 200 meters away, and the centre of Golden Sands is 5 min. away walking. If you need a full relax you can try the "Spa and Wellness Centre" in the complex agains pay. The wellness centre offers Jacuzzi, Steam bath, Sauna, Massages, Beauty and relaxation procedures. Hello,we are Dani and Lina Nikolov from Varna. Lina is 31 years old, I'm a bil older - only 33 :) We've met in 2014, start living together in 2015 and finally got married in April 2017. Our favourite things to do are waching old movies mostly at home on TV, shopping (both of us) on sales when we can get a good offers, having dinner outsite in the summer (in Varna there are a lot of restaurants on the beach). We travel every year to a new place (I think that's we love most).For the last five years we've visited Tenerife (Canarian Islands), Madrid (Spain), Barselona (Spain), Rome (Italy), Boston, New York, Miami, Chicago (USA). Traveling make us full of memories and a looot of photos :D There is no more walls at home without photos :D That's becouse of Lina. So about her- she is a Finansial consultant in Raiffaisen Bank Bulgaria, me- I am a Barthender. In my free time I love to play football and watch every game that's on TV.During the time I'm doing my football things Lina is cooking or reading a books. That's how we are dealing the stress. 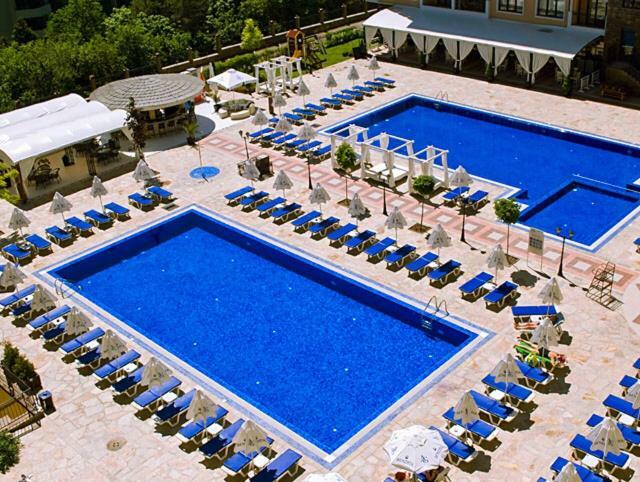 Golden Sands is a summer resort 17 km away from Varna. Our apartment is located in Aparthotel Bendita Mare, placed on second beach line.It is 5 min walking from the centre of Golden Sands where you can find a lot of restaurants, bars, discos, casinos and many things to do day and night. The best party place is MegaPark Dolphin - you can buy tickets for Foam party in the day or just go out for the famous Tiki cocktаils or The "One littre Cocktаil".The Mega Park have non stop "Happy hour" for drinks - Pay one get two. If you want a beach party you should go to "Mojito Bar". The best mexican food you will find in Sombrero restourant, located next to the Mega Park Dolphin. If like gambling and want to visit a nice Casino try that in Hotel International. You can try beach massages- the best ones are from the Admiral girls- you will find them on the beach infront og Hotel Admiral. All listed places are 5-10 min away from the apartment- you should go down to the beach line and take right direction. 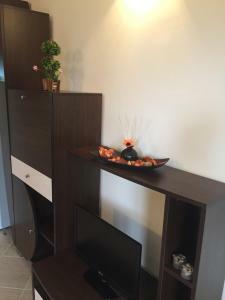 Leggi prima di prenotare Apartment in Bendita Mare ApartHotel accetta le richieste speciali. Aggiungile nel prossimo passaggio! È richiesto un deposito cauzionale di 100 BGN all'arrivo, pari a circa 51.13 EUR. Il deposito è completamente rimborsabile al check-out, se non sono stati causati danni alla struttura. Siete pregati di comunicare in anticipo a Apartment in Bendita Mare ApartHotel l'orario in cui prevedete di arrivare. Potrete inserire questa informazione nella sezione Richieste Speciali al momento della prenotazione, o contattare la struttura utilizzando i recapiti riportati nella conferma della prenotazione. È richiesto un deposito cauzionale di BGN 100 all'arrivo. L'importo corrisponde a circa 51.13EUR. Potrai pagarlo in contanti. Dovresti ricevere il rimborso al momento del check-out. Il deposito ti sarà rimborsato per intero in contanti dopo una verifica dello stato dell'alloggio. Per calcolare il punteggio sono necessari almeno 5 giudizi. Puoi contribuire anche tu: prenota Apartment in Bendita Mare ApartHotel e dopo il soggiorno lascia una recensione!